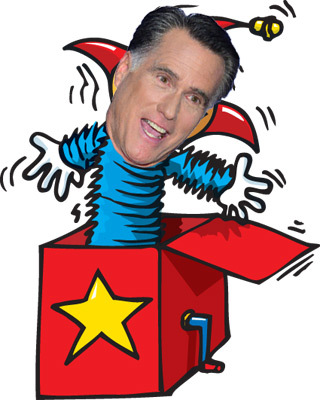 Anton Brand/Shutterstock; Harry E. Walker/MCT/ZUMAAccording to Craig Unger at Salon, a “highly reliable source” tells him that the Romney campaign is “chortling with glee” over an October Surprise they plan to unleash in the coming days. Really? Well fine. I wasn’t going to do this, since the prospect of an October Surprise hasn’t really been a topic of conversation this year, but back in 2004 it was, and I wrote a short little history of October Surprises for the Washington Monthly. It never got published, but by God, no research should ever go to waste, should it? So in honor of October 1st, here it is. If you have the stamina to make it all the way to the end, there’s even a short little contest. Enjoy. In July 1940, at the height of his powers and running for an unprecedented third term, Franklin Roosevelt surveyed the Democratic party in search of a running mate. After due consideration his eyes lighted on his Secretary of Agriculture, Henry Wallace, a selection his closest advisors and most of the Democratic party chiefs warned him away from. FDR refused to listen: “They will go for Wallace or I won’t run,” he insisted testily. And why not? Wallace was popular, a good speaker, and had done a creditable job of running the Department of Agriculture. What’s more, he was honest to a fault, a fervent New Dealer, and intensely loyal to Roosevelt. Oh, and one more thing: in this era before FBI background checks, it turned out that Wallace had an additional trait that FDR either didn’t know about or didn’t take seriously: he was a wee bit eccentric. Unfortunately for Roosevelt, his Republican opposition did know. It turns out that Wallace had long had a weakness for religious mysticism, and in the early thirties he had hooked up with Nicholas Roerich, a fork-bearded, Tibetan-robed exponent of Theosophism called “The Guru” by his followers. This still might not have been so bad except for one more detail: Wallace had written letters to Roerich, letters that typically started with “Dear Guru,” rambled along for a few paragraphs of mystic nonsense, and ended with “May Peace, Joy and Fire attend you as always.” And in 1940 those letters still existed, safely preserved in a Wall Street vault by the Republican national treasurer. With the help of a friendly reporter from the Pittsburgh Post-Gazette, the Republican plan was simple: hold on to the letters until shortly before the election and then release them, resulting in a frenzy of bad publicity that would sweep them to victory in November before the Democrats had a chance to respond. It was, perhaps, the first example of something that today is a staple of American political legend: the carefully planned and deliberately timed October Surprise. In the end, the Republican plan didn’t work and the letters were never released. Why? Perhaps because Wendell Willkie decided it was beneath him. Perhaps because the Republicans were worried it would cause a backlash. Or perhaps it was because Willkie had a mistress and FDR made it clear that two could play the October Surprise game. Whatever the reason, the letters stayed in their vault and Roosevelt ended up winning the election by 5 million votes. 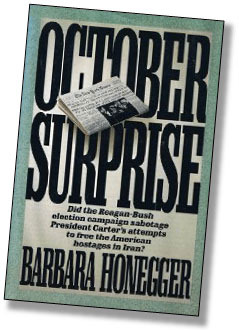 if they kept the hostages in Tehran until Reagan was safely in the White House. The Iranians agreed, and after his inauguration Reagan kept his end of the bargain by funneling arms to the ayatollahs via Israel. Honegger’s baroque conspiracy theorizing convinced few, and even Gary Sick’s more sober analysis three years later has mostly been brushed off. There are plenty of open questions about what really happened, and plenty of websites that breathlessly retail Honegger and Sick’s charges, but the consensus in Washington is that, in fact, nothing happened. This isn’t to say that October Surprises are merely the stuff of black helicopter conspiracy theorists, though. On the contrary. In fact, there’s been at least one genuine October Surprise in recent presidential history, and it will come as no surprise to anyone that this particular jack-in-the-box popped its lid in 1968 — and the man turning the crank was Richard Nixon. The case was made conclusively by Nixon biographer Anthony Summers in his 2000 book The Arrogance of Power. Nixon, says Summers, was worried that LBJ might help the Democrats to victory by starting up peace talks in Vietnam, a popular move that almost certainly would have helped Hubert Humphrey’s candidacy. But Nixon did more than just worry. Via a Freedom of Information Act request, Summers got hold of an FBI memo that reported on the results of a wiretap on the phone of the South Vietnamese ambassador. It turns out that an official at the Republican National Finance Committee had contacted the ambassador and told him to “hold on,” a message that apparently reached its target: two days later South Vietnamese President Nguyen Van Thieu refused to participate in the peace talks and LBJ’s overtures went nowhere. Nixon went on to win one of the closest elections in history. So October Surprises come in all shapes and sizes: real ones, imagined ones, and ones that never happened. But it’s worth pointing out that they’ve become such an ingrained part of American political folklore that even successful ones can end up producing little more than electoral cynicism, doing more harm than good in the end. Need an example? Look no further than California’s raucous gubernatorial recall election in 2003. On October 2, five days before the election, the Los Angeles Times published a long awaited bombshell: in a meticulously researched front-page story they charged that Arnold Schwarzenegger had a long history of groping and sexually assaulting women that he had worked with in Hollywood. As it happens, this wasn’t actually much of a surprise: it was an open secret even before the Times story was published; the facts of the story were never disputed; and Schwarzenegger himself admitted the next day that he had “behaved badly.” Nonetheless, just the fact that the Times printed the charges so close to the election had a galvanizing effect: most voters saw it as simply another dirty campaign trick and Schwarzenegger’s support actually rose. In the end, the recall passed 55%-45%. Despite this decidedly mixed record, the political chattering classes — and official Washington alike — seem unable to resist speculating about October Surprises every four years. During the 2000 presidential campaign the Wall Street Journal even ran a contest, kicked off by predictions from three of its own: Melanie Kirkpatrick suggested a last-minute arrest of Slobodan Milosevic, John Fund posited a government shutdown unless Republicans approved a Medicare drug benefit, and Seth Lipsky speculated about a breakthrough in the Middle East peace process (plus a pardon for Israeli spy Jonathan Pollard). As it turns out, of course, Slobo was eventually captured by Bush, the government continued to chug along during the election, the Middle East remains at war, and Pollard continues to languish away in North Carolina. Obama (or Benjamin Netanyahu on his own) will bomb Iran’s nuclear facilities. Romney will unveil bulletproof evidence that Obama knew an attack on the Benghazi consulate was imminent but decided to do nothing about it. Obama will open up the Strategic Petroleum Reserve in order to reduce gasoline prices. In a surprise move to lock down the stoner vote, Obama will issue an executive order legalizing marijuana. A secret videotape will be leaked showing Romney insulting half the country as a bunch of moochers who refuse to take responsibility for their lives. Oh wait.…. Add your own in comments. The best answer gets the warm glow of being prominently displayed in a future blog post. Corn on “Hardball”: What’s Romney’s Strategy in the Debates?